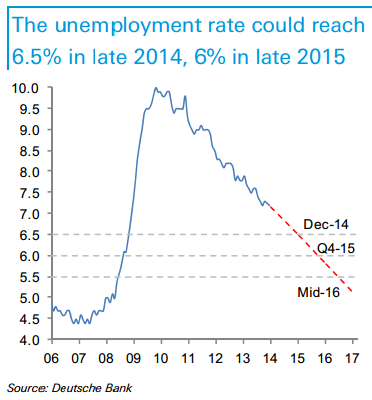 DB's chart of the US unemployment rate (below) received numerous comments on Twitter. Clearly the projection of the linear decline continuing at the same rate is a bit aggressive. But many of the comments were dismissive of the measure altogether - arguing that these falling unemployment levels are not that meaningful in the face of the declining labor participation rate. There is no question that labor force participation in the US has been falling as more people drop out of the workforce. But that measure could be misleading because as the population ages, the workforce will shrink naturally. For example Canada is also experiencing declines in its headline labor force participation rate. But when adjusted for aging, its labor force participation is actually growing (see chart). It's not clear however if the orange line above represents "true" unemployment. For example teenagers had far greater employment opportunities in the 90s than they do now, with youth labor force participation having declined sharply over the past decade. But should a 17 year-old who lives with her parents and can't find part-time work be classified as "unemployed"? Evidence suggests that a great number of the labor force "dropouts" were in the 16-19 age group. This would indicate that the "effective unemployment" rate (depending how one defines "unemployed") is somewhere between the orange and the blue charts above, with DB's projection representing the lower boundary.